Airport runway lighting is a specialty that the professionals at Contractors West, Inc. have excelled at for well over two decades. All of our airport lighting products meet and exceed FAA specifications, and we use LED lighting that offers crisp illumination and increased visibility. Not only that, but because they use much less power than traditional lighting you will save money, while enjoying less call for repairs and maintenance because of their long-lasting nature. 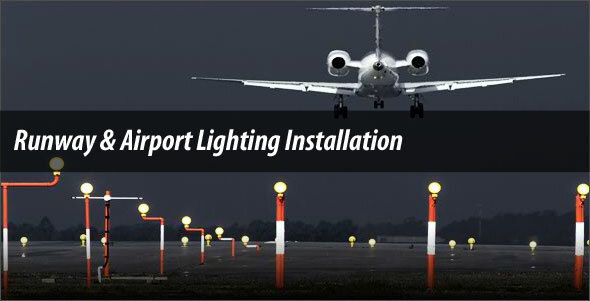 Contractors West, Inc. will make certain that every aspect of your airport lighting is up to its very important job 24/7. For timely installation, service and repairs call on the Valley’s most trusted professionals to keep your airport or airfield firmly in the light. Contractors West, Inc. has long been a reliable and efficient resource in the installation of overhead highway signs and their companion support structures. Such projects can range from basic to intricate, and our experienced professionals will guide you through the planning phase of your project and through installation of the structures you order. Contractors West, Inc. has constructed, maintained, repaired and upgraded traffic signal intersections for roadways and highways for over 30 years. As an experienced electrical contractor with a proven record of success, we have long been a recognized leader in the Traffic Signal and Highway Electrical Construction industry in Arizona. Copyright © 2019 - Contractors West Inc.